For Musa Abdul-Aleem, his basketball future is right now. Mathematically speaking, getting into the NBA is a long shot for any of the 4,000-plus NCAA Division-1 college basketball players in the United States. Theoretically, it’s even tougher for college players who are older than the traditional college student to land a spot on an NBA roster. Because as much as the NBA claims it wants more mature athletes representing its brand — the league is reportedly working toward raising its player age minimum from 19 to 20 years old — the NBA Draft is still a very young man’s domain. Abdul-Aleem is hoping to be one of the league’s 60 draftees this Thursday. But at 27 years old, he knows the odds are against him. That doesn’t mean he’s giving up on his NBA dream. 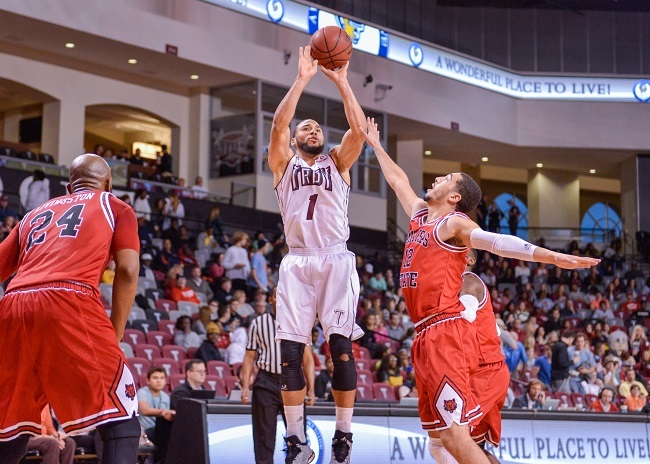 As a 6-foot-5 senior shooting guard at Troy University this past season, Abdul-Aleem averaged a team-high 16.0 points per game to go with 4.8 rebounds and 1.2 steals. He finished fifth in the Sun Belt Conference with 70 three-pointers made, connecting on 37 percent of his attempts from long range. After transferring from the University of South Florida, where he played two years, Abdul-Aleem more than doubled his playing time at Troy (29 minutes per game at Troy, 13 mpg at USF) and quadrupled his scoring average (4.1 ppg at USF). In his first game for the Trojans, Abdul-Aleem scored 16 points — more than he had scored in any game at USF. Two games later he dropped 26 points with six threes against Southern Mississippi. He topped 20 points seven more times. Against Georgia State he scored 33 with seven threes; against Georgia Southern he had 25 points and 12 rebounds; and in his collegiate finale against South Alabama, Abdul-Aleem scored a career-high 37 points, hitting eight threes. 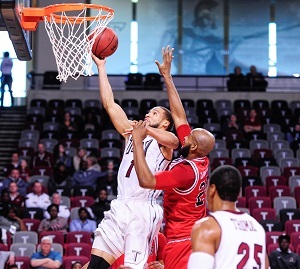 After two years of being just another guy at USF, Abdul-Aleem put himself on the NBA radar at Troy. He now has an agent — Muhammad Abdur-Rahim, a fellow Muslim who works for Seattle-based Goodwin Sports Management — he has worked out in front of NBA scouts, and he has at least a puncher’s chance of being selected in Thursday’s NBA Draft. UMMAH SPORTS: Doubling your minutes and quadrupling your scoring is rare for a senior, even when it’s a transfer situation. What was behind the sudden improvement going from South Florida to Troy? MUSA ABDUL-ALEEM: The coaching staff instilling trust in me and letting me play. They reminded me to just be relaxed and have fun. The coaches at Troy did a good job of bringing the best out of me, Alhamdulillah. US: How would you grade your senior season? MA: I’d give myself a B-plus. I think I played well. I shot the ball very well. I don’t think I was in the best condition. Right now I’m in the best shape of my life. I’ve lost 17 pounds in the past month. I’m on a no-sugar diet; my body is night and day compared to last year. My vertical (leap) has increased a couple of inches. I feel really good. I did good at Troy, but I could’ve done better. In college, you have schoolwork and you have basketball, so you’re probably not at the highest level you can go in either one. You’ve got to give up a little bit. You see some athletes pull more toward athletics, so they don’t do so well in the classroom. And some pull more toward academics, so they don’t do so well on the court. It was a bit hard for me to find a balance and stay in the middle. US: When your senior season is over and you start to pursue pro basketball, what’s the first thing you have to do? MA: The first thing you’ve gotta do is find a good agent. Find the best possible agent. Investigate what they’ve done in the past, which players they’ve represented. I have a very good agent named Muhammad Abdur-Rahim. Under his umbrella are (Portland Trail Blazers All-Star point guard) Damian Lillard, (Denver Nuggets center) J.J. Hickson, (overseas pro) DeQuan Jones … He has a lot of good players, so I’m blessed that he could squeeze me onto his roster. You don’t want to get an agent with too many players who can’t focus on you, but you also want somebody with experience. US: Did you take a break between the end of the college season and the beginning of the pre-draft process? MA: I don’t like to take long breaks, but I took a week or two off from basketball — not even a full two weeks — before getting back into it. I started doing 1-on-1 drills with (former Troy assistant) Coach (Billy) Begley to get prepared for my workouts with (trainer) Rodney Heard. It’s been an amazing experience, getting in the best shape of my life this past month and a half. US: What do you focus on in those workouts? MA: It’s not one particular thing we focus on; we work on a lot of things every day. I’ll do ball-handling for about 15-20 minutes every day, which is probably more than the average workout. I put up a lot of shots and do a lot of running. Three things you need to be able to play in the NBA — you have to be in good shape, you have to be able to shoot the ball, and you have to be able to dribble the ball. US: Did you go to either of the NBA scouting combines in Chicago and Portsmouth? MA: No, we tried to get into them, but they were full. I didn’t get that opportunity. US: How big of a factor is your age in this process? MA: It’s the biggest factor. Nowadays, teams are drafting off potential, not talent. Coming out for the draft at 27, they think I’ve reached my peak of what I can become, but I believe you can get better until you can’t play anymore. I feel better than I did when I was 26. With the draft, my biggest issue isn’t my talent or ability, it’s my age. When some teams see “27 years old,” they turn the page to the next player. US: But there should be some teams that could appreciate that you’ll be more mature than the typical rookie. MA: Absolutely. There are a few teams that are very interested in me. The Miami Heat is one. The Atlanta Hawks and the Indiana Pacers, I think they’re interested. I worked out in front of the Heat and they were very impressed. US: What are the workouts like when you’re in front of a team? MA: They last a little more than an hour. You go through some shooting drills, go through some dribbling drills. You do some 1-on-1 and 2-on-2, some pick-and-roll stuff. Then they run you at the end to test your conditioning. My workouts went really well. When I worked out for the Heat, they said I was the best-conditioned athlete there and the best shooter. US: So there are other draft prospects there, right? Not just you? MA: Right. In our group we have Jarvis Williams from Murray State, Kenny Chery from Baylor, Trey Zeigler from TCU, Jelan Kendrick from UNLV, Richaud Pack from Maryland and Jesse Morgan from Temple. US: What role or position do you see yourself playing in the NBA? MA: Combo guard. I’m trying to be a point guard-slash-shooting guard instead of a shooting guard-slash-point guard, you know what I mean? Being a 6-5 point guard, a lot of teams could use that. I’m working more on my ball-handling in order to make that transition. US: If you don’t get drafted and don’t get a training camp invite, would you be willing to go through the NBA’s D-League for a possible shot? MA: Honestly, I’m not trying to go the D-League route. Not at my age. The best thing for me to do if I don’t go to the NBA is to make money overseas. Several teams overseas have been interested in me; I just got a text from Turkey this morning. But going overseas, that’s the easy route. The route I want to take is the NBA. US: I talked to your twin brother, Muhammad, after his college career ended and he said his dream is to play pro ball in a Muslim country like Saudi Arabia or Oman. Would you be looking at going somewhere similar if you had to go overseas? MA: Oh, of course. I wouldn’t mind playing in Saudi or Turkey, Qatar or Abu Dhabi. I have teams in Muslim countries reaching out to me now. I would prefer to play in an Arab country just for the fact that there would be a lot of Muslims there. But realistically for me, at this stage in my career I have to go where I can make the most money. So wherever the money is, that’s probably where I’ll be. That’s another reason why my focus is on the NBA more than anything. I feel like I’m ready. I just wish I’d had more opportunities to show what I can do in front of NBA scouts. I wasn’t on the NBA radar at all the last two years; I just made it onto the radar this year because of the success I had at Troy, but it wasn’t enough to get 15 or 20 NBA teams to work me out. US: Do you kind of have to draw inspiration from underdog stories of guys who made it to the NBA in unconventional ways? The guys who didn’t get drafted, or weren’t big stars coming out of college, or went overseas first before getting to the NBA? MA: You look at somebody like DeQuan Jones. He wasn’t on the NBA radar coming out of Miami. He only averaged three or four points per game; he wasn’t even a starter in college. But he worked his tail off in the summer, he worked out for a few NBA teams, and the Orlando Magic decided to pick him up for a one-year contract. He’s not in the NBA anymore, but he made it, you know? Now he’s overseas making half a million dollars. US: How is your brother, by the way? Is he playing anywhere right now? MA: He’s staying in shape in case that opportunity comes up. I know when he gets the chance, he’ll take it. US: Has fasting for Ramadan had an impact on your training? MA: Absolutely. Ramadan has had a tremendous impact on my schedule — what I can do, what I can’t do. I can’t even explain it. Like, I’m working out between three o’clock and five o’clock today, my first real workout since Ramadan started. I played a little at the gym the first few days, and that went OK. Then I rested and today I’m getting back at it. Because I’m fasting, I won’t be able to train like I’d been training. Going from drinking two or three gallons of water to drinking nothing is a big turnaround for your body. I’m still working on it. Just energy-wise, getting the body used to not eating and drinking the amount it usually consumes can be tough. US: With the draft less than a week away, there’s not really much else you can do right now, is there? MA: Just waiting right now. Waiting for the draft, waiting to get picked up by a summer league team, waiting until somebody calls your agent. I know that if I can make a summer league team, I can impress the GMs and coaches and owners. I know I can contribute to a team. What would a Muslim do with A-Rod’s historic home run ball?